For January we have chosen calming, relaxing and soul-soothing embroideries. The days are slowly getting longer again, but they are far too short and the dark, warm evenings can be used for nice things to do in the living room. Stitching, Crocheting, or Knitting is not only relaxing in winter times, but especially winter invites us to calm down a little and if you ever wanted to started something crafty, now it is the best time to start from scratch or take up a hobby again which you have left aside for a long time. Crafty things like the above mentioned is for many a "women's thing". But men can do that as well. 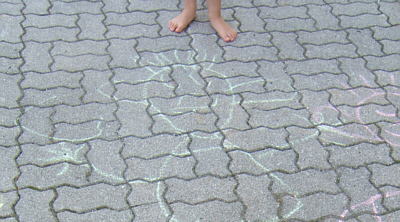 Especially cross stitching and the effort to find "the perfect path" through a pattern has to do with structural thinking and logic. 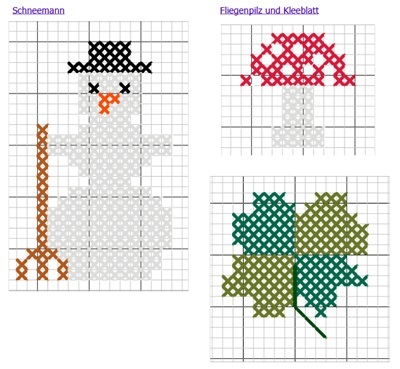 Our January pattern: a snowman with broom and black hat, a toadstool and a four leaf clover - the new year should start with some lucky charms.